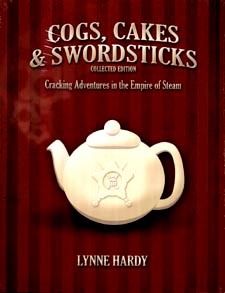 Cogs, Cakes & Swordsticks is a game of steampunk pulp adventure, designed to be played in the comfort of your favouite tea shop with your friends, and requiring nothing more than your imagination, a pen, napkins and a sugar cube (should a six-sided die not be readily forthcoming)*. This brand spanking new edition combines both the core rulebook and the game's first supplement, plus a little something extra. So grab the cake of your choice and a piping hot cup of tea, settle down and allow us to welcome you to the Empire of Steam - an age of marellous gizmos and mad inventors, Babbage Engines and flying steamships, dashing heroes and femme fatales, and the odd fiendish villain for good measure. In short: a time of exploration, intrigue and high adventure! We're glad you could join us. *Although sugar cubes aren't actually cube shaped these days. What ever is the world coming to?